We don’t talk about why it happened. That seems almost foolish by now. Just another ridiculous tech-bro capitalist dream, collapsed on its side and tumbling down into the ocean. But it was a state, it defined itself, and, at least until the prevailing needs of the world change, that sunken collection of buildings is still a foreign country, just… not one people can live in. But people don’t have to live there for business to go on. In D-7EC7, you and your friends are playing tiny covert drones, working in the sunken towers of a failed corporate cityscape. Dozens of little drones are there to make deliveries of digital data in places nobody can technically oversee the exchange. Except not all of you are piloting your limited-energy drones to do deals, you’re there to stop deals. A hidden-movement micro-game of only 16 cards, D-7EC7 builds its own space, then players sneak around, trying to avoid giving away their location to one another. You’ve only got a few minutes, down in the dark below – you’d better move quick. For international customers, you may prefer to buy print-on-demand via DriveThruCards (the same printer we use for our local stock). 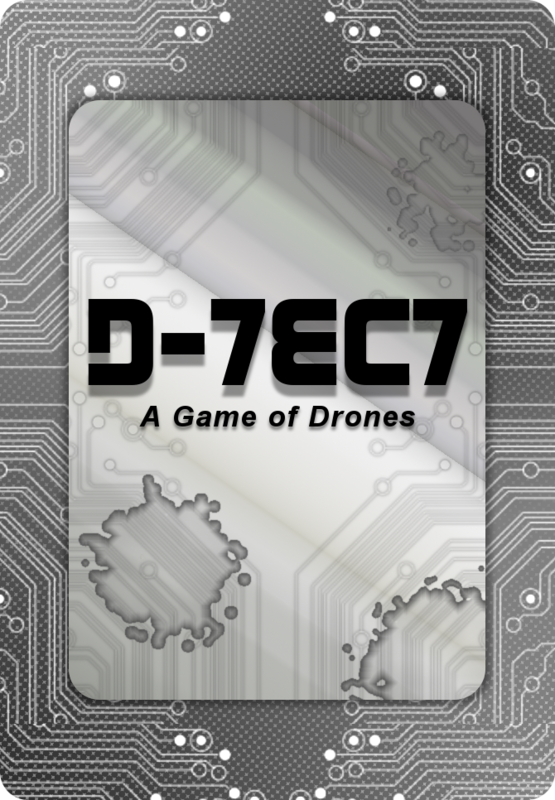 You can buy D-7ec7 at DriveThruCards as a professionally printed card deck. Already bought D-7EC7? Download the latest revision of the D-7ec7 rulebook. You can also follow us to receive notifications of rules updates!